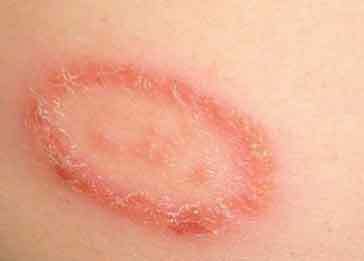 The term ringworm or ringworms refers to fungal infections that are on the surface of the skin. The name is derived from the false, early belief that the infection was due to a worm. There are many types of rash caused by fungi most do not mimic the round scaly rash produced by Tinea Corporis (ringworm). But rashes can be challenging to diagnosis. There are a number of other rashes that can look like ringworm but their causes are completely different. It is possible to acquire ringworm from a variety of places and circumstances. The greatest risk factor is coming in direct contact with someone else that is infected with it. Warm, moist areas are favorable conditions for the growth of fungi, so areas such as communal showers and locker rooms are areas in which transmission is favorable. However, any contact with an infected person or a contaminated surface can cause ringworm infection. Often, the diagnosis of ringworm is obvious from its location and appearance. Otherwise, skin scrapings for microscopic examination and a culture of the affected skin can establish the diagnosis of ringworm but this is usually not required. Ringworm is difficult to prevent. The fungus that causes ringworm is common and contagious even before symptoms appear. Help reduce your risk of ringworm by wash your hands often to avoid the spread of infection. Avoid excessive sweating. Avoid infected animals. The infection often looks like a patch of skin where fur is missing in animals. In some cases, though, you may not notice any signs of the infection on a pet. Ask your veterinarian to check your pets and domesticated animals for ringworm if concerned. Do not share personal items. Ringworm is easily treated at Urgent Care or by your primary care doctor or dermatologist. When on the open skin, ringworm is treated with topical antifungal creams. Prescriptions creams are more potent than the over the counter creams and need to be applied less frequently. Though ringworm is usually not contagious after 3-4 days of using the topical antifungal cream. It may take a few weeks before it disappears. Continue using the cream until the rash is completely gone and be sure to check your entire body for other newly forming areas. Unfortunately, ringworm in the hair requires oral antifungal pills. The topical just does not penetrate deep enough into the hair follicle to cure it. A longer course of treatment for this is required. See our Physicians and P.A.s at Doctors Urgent Care for the highest quality medical evaluation and treatment. We are familiar with and treat ringworm and other rashes every day.